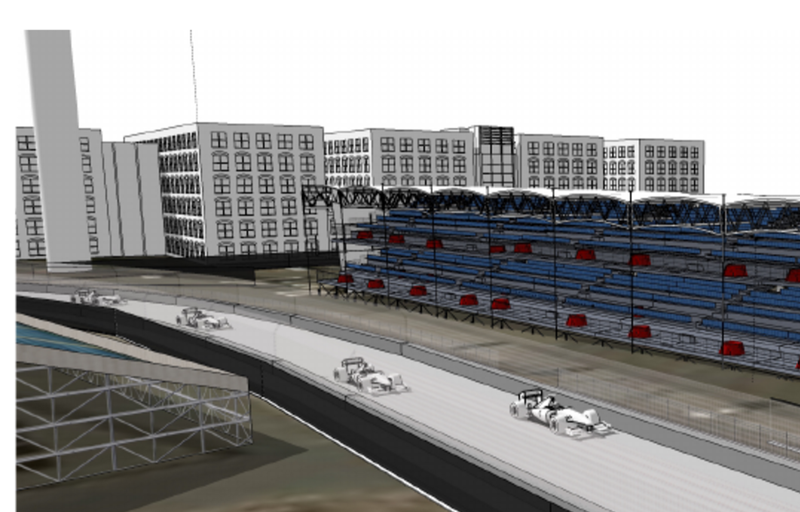 The Boston Conservation Commission will be reviewing the Boston Grand Prix' request of changes to roadways: New Cypher Street, South Boston Bypass Road, West Service Road Extension, West First Street, Congress Street, and property of Massachusetts Convention Center Authority required to create the auto race track on South Boston's Seaport streets. There will be an opportunity for public comment. Sign Language interpreters are available upon prior request. The Commission will hold a public meeting immediately following the last hearing or as appropriate following any hearing. Plans and filings with the Commission may be viewed at the Environment Department, Boston City Hall, Room 709, during regular business hours, 9:00 AM to 5:00 PM Monday through Friday. For more information, call 617-635-3850. The Boston Parks and Recreation Department and the Mayor’s Office of Neighborhood Services invite the community to the second meeting to discuss upcoming improvements to Children’s Wharf Park located at 64 Sleeper Street, Boston. The Parks Department will provide an update on the project and the designer, Michael Van Valkenburgh Associates, Inc., will share their conceptual design for the park. Following the presentation, there will be an open discussion about the ideas presented. Fort Point is getting cleaner this spring. Street cleaning starts today on A Street street. In addition, Binford Street (from A Street to the Fort Point Channel) will have street cleaning every Tuesday 9 am - 1 pm from April through November. The odd side of the street (closest to Gillette) will be the first and third Tuesdays starting April 19th due to the April 4th snowfall and the even side is the second and fourth Tuesdays starting April 12th. The Fort Point Neighborhood Association is holding Fort Point's 12th annual Boston Shines April 29th - April 30th. Fort Point businesses are invited to participate on Friday, April 29th from 11 am - 2 pm and Fort Point Residents on Saturday, April 30th from 10 am - 3 pm. Boston Shines Fort Point style creates a living tapestry of flowers, vines, and community along A Street. Volunteer today and help beautify your neighborhood. No green thumb required. If you have any questions, please contact FPNA. Are your New Year's resolutions a distant memory? If getting more involved with your community is still pending on your list, there is plenty to offer on Civic Engagement Tuesday, April 5th, There are public meetings to envision a new Dot Ave Corridor, discover whether the South Boston Bypass Rd could re-open to non-commercial traffic and talk about the benefits and impacts of the Boston Grand Prix. 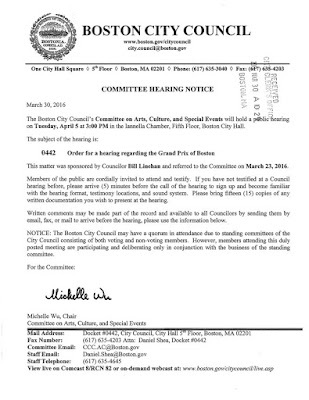 Boston Grand Prix City Council Hearing: Councillor Linehan called for a hearing to be held on the Boston Grand Prix stating the importance for City Council to give residents a voice in the process and examine the impacts on the neighborhood. The Committee of Arts, Culture & Special Events will be holding the public meeting (docket # 0442) at City Hall, Iannella Chamber, 5th Floor at 3 pm. You may also submit written comments and questions to CCC.AC@boston.gov and Councilor Linehan prior to the hearing. Councilor Michelle Wu is taking questions beforehand on twitter. Tweet #QsforIndyCar @wutrain. Written comments may be part of the public record and are available to all City Councillors in advance of the hearing. Attend or watch live on Comcast 8/RCN 82 or on the web. South Boston Bypass Road & HOV Pilot Program Results & Feedback Meeting: The Massachusetts Department of Transportation (MassDOT) invites the public to attend a meeting to provide South Boston Bypass Road and HOV Pilot program results and gather public feedback. The public meeting will be held at the Boston Convention & Exhibition Center, room 154 from 6 pm – 8 pm. from 6 pm – 8 pm. 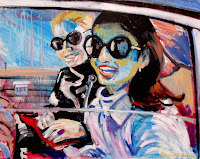 Exhibiting artists are: Laia Albaladejo, Maltsya Batelman, Joel Benjamin, Nikolay Cherny, Anna Comella, Dawna Davis, Julian De La Garza, Daniel Demiller Jr, Nathan Evans, Elisa Hamilton, Judith Klein, Nina Libin, Christina Liotti, Karen McFeaters, Janet Parker, Jenne Reyburn, Amanda Richards, James Russell, Alicia Savage, Anh Sawyer, Philip Sawyer, Margaret Shepherd, Olga Shmuylovich, Souther and Sara Tchen-Susman. In celebration of Boston Design Week, Made in Fort Point presented "One at a time...Slow fashion in a fast world" on March 31st. 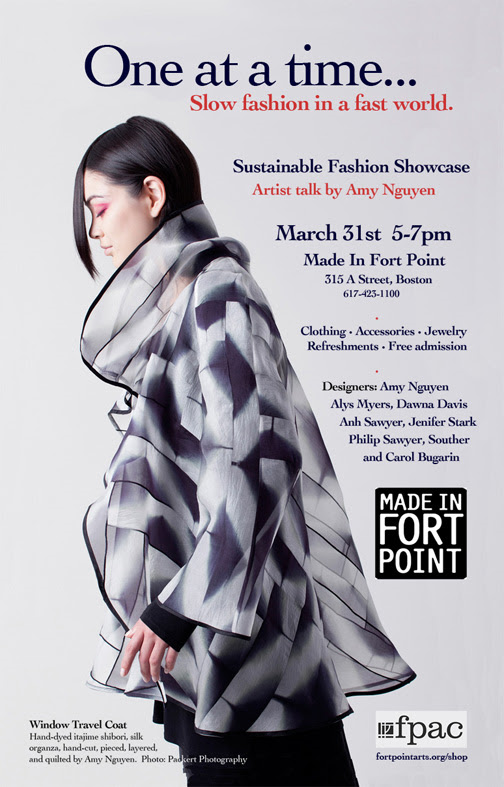 Local celebrity designer Amy Nguyen headlines a group of Fort Point artists passionate about sustainable, long-lasting fashion. 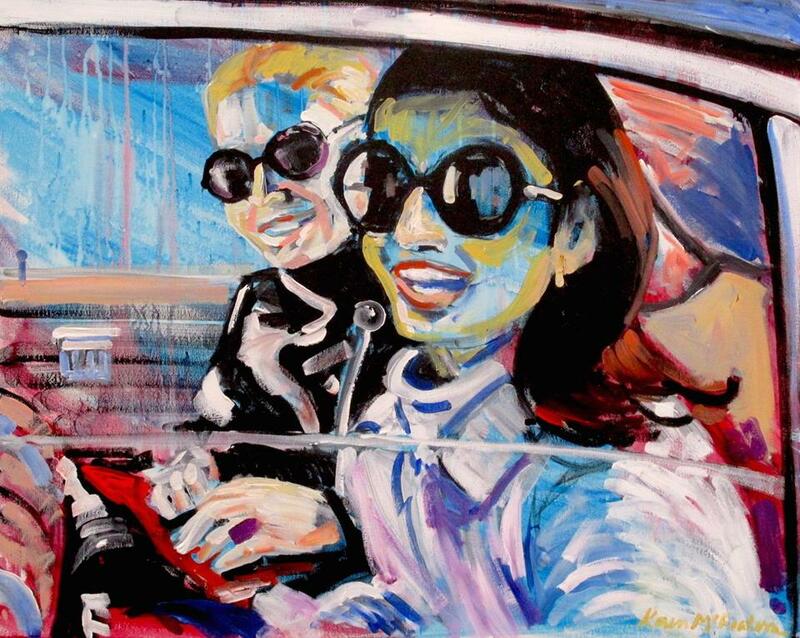 This special event includes an artist talk by Amy and displays hand made designs in clothing, accessories, and jewelry by designers: Amy Nguyen, Alys Myers, Dawna Davis, Anh Sawyer, Jenifer Stark, Philip Sawyer and Carol Bugarin. Made in Fort Point sells and exhibits art, craft and design of over seventy-five Fort Point Arts Community members and is located at 315 A Street. 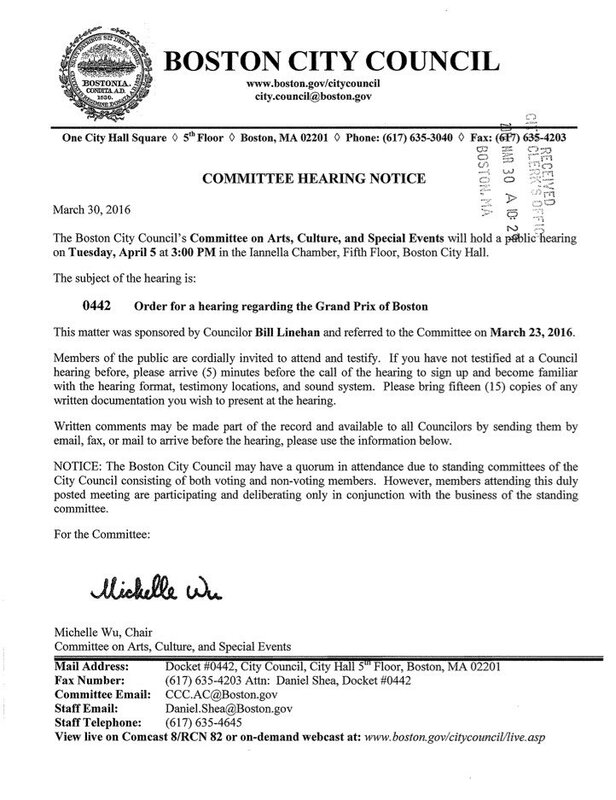 Boston City Council is holding a hearing on the Proposed Grand Prix of Boston IndyCar Race on Tuesday at 3pm. The public is invited to attend and testify. In addition, testimony and/or questions for the race can be sent ahead of time to ccc.ac@boston.gov and Councillor Wu (Michelle.Wu@boston.gov) and they will be printed and included in the packets distributed to the committee. Make sure they're sent in by Tuesday at 2pm. Councillor Wu is also taking questions on Twitter. Tweet #QsforIndyCar and her (@wutrain). On behalf of the South Boston Waterfront Sustainable Transportation Committee, MassDOT is hosting a public meeting to review the results of the South Boston Bypass Road and HOV 6-month pilot program. The meeting will be an opportunity for to review the pre, during, and post pilot data and gather public feedback on the impact of the pilot program. The six-month pilot program, launched on August 17th, opened the South Boston Bypass Road to non-commercial traffic at all times in the section from Richards Street to West Service Road, and opened the South Boston Bypass Road in the eastbound direction from I-93 to Richards Street during AM peak hours (6:00 am to 10:00 am). The pilot also opened the HOV Airport Express Lanes from I-93 Northbound, Kneeland Street and Traveler Street to the Ted Williams Tunnel to all vehicles at all times. If you have any questions, please contact Jim Kersten, Legislative Liaison, MassDOT. The meeting space is accessible to people with disabilities. If you need a reasonable accommodation (such as American Sign Language Interpreters, assistive listening devices, handouts in alternate formats, etc.) and/or language assistance to fully participate, please contact Jim Kersten at MassDOT at 857-368-9041 or via email before March 29, 2016. Such accommodations will be provided free of charge.